There are several factors that led us to wanting to produce Airpark. According to industry experts, the aviation industry will be facing a shortage of labor and needs to reach out to youth. 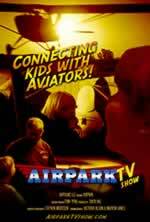 Film students need real productions to get experience to learn how to develop quality programming and material, and working professionals need projects to work on, hence, the inspiration for Airpark TV. First, today’s youth don’t have nearly the access to the types of activities that many of us grew up with. Between their electronics, the hover parents, the distance from the open areas and just a general sense of fear, many youth grow up simply playing video games and watching TV. We figured, we’ll perhaps we can reach them on their TV, Pad device and perhaps interest a few to want to be able to get out and experience some of the things any 12 year old in our times enjoyed. From RC aviation, to flying in a real airplane, to helping build a replica, Airpark hopes to introduce many ideas to the youth as well as coordinate events to film where youth get a chance to participate. There are many youth outreach programs that organizations are currently doing. Airpark is a perfect complement that can help promote those efforts, working side by side to help bring more kids into aviation, to help the aviation industry find their help for the future. The show should also provide great memories and healthy activities for the kids participating. Not only that, it’s a show that mom and dad can trust will be good for their kids! Obviously, since we all must work for a living, we have a commercial interest, but, in addition to working to help youth, we plan to offer formal paid apprenticeships to qualified film students as normal fare for production. This professional experience is what many in film schools find lacking. Certainly there was a network dedicated to television shows about aviation, that is no longer on the air. The difference between our show and those is that we seek to captivate a younger audience and provide engaging activites, not only to watch, but to be part of as the show is produced throughout the country. We also plan to distribute the show not only on air, but via diigital distribution where our intended familiy and youth audience has easy access, any time they want to watch it. The show will be designed so that the viewers won’t want to miss the next episode. All in all, the program will offer healthy, clean familiy programming, learning and be able to offer youth something that they just aren’t getting exposed to these days, and offer opportunity for jobs for the older youth.